A selection of Nail images taken from recent photos. 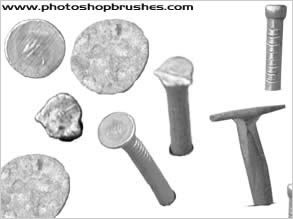 The photoshop brushes feature several different types of nails at various angles some from above some sideways on. The Metal Photoshop Brushes also have a good selection of nail images on a grunge metal plate. Will be adding to this set soon as It could be far better and should have loads more brush variations.